Definition at line 33 of file VirtRegMap.h. Definition at line 35 of file VirtRegMap.h. Definition at line 70 of file VirtRegMap.h. Definition at line 83 of file VirtRegMap.cpp. References llvm::AMDGPU::HSAMD::Kernel::Arg::Key::Align, assert(), llvm::MachineFrameInfo::CreateSpillStackObject(), llvm::MachineFunction::getFrameInfo(), getRegInfo(), llvm::TargetRegisterInfo::getSpillAlignment(), llvm::TargetRegisterInfo::getSpillSize(), llvm::TargetRegisterInfo::isPhysicalRegister(), llvm::TargetRegisterInfo::isVirtualRegister(), NO_PHYS_REG, and Size. Referenced by llvm::RegAllocBase::allocatePhysRegs(), llvm::LiveRegMatrix::assign(), getPhys(), and isACalleeSavedRegister(). Definition at line 120 of file VirtRegMap.cpp. References assert(), llvm::MachineRegisterInfo::getRegClass(), llvm::MachineFunction::getRegInfo(), llvm::TargetRegisterInfo::isVirtualRegister(), and NO_STACK_SLOT. Definition at line 128 of file VirtRegMap.cpp. References assert(), llvm::MachineFunction::getFrameInfo(), llvm::MachineFrameInfo::getObjectIndexBegin(), llvm::TargetRegisterInfo::isVirtualRegister(), and NO_STACK_SLOT. Definition at line 119 of file VirtRegMap.h. References llvm::IndexedMap< T, ToIndexT >::clear(), grow(), hasKnownPreference(), and hasPreferredPhys(). Definition at line 111 of file VirtRegMap.h. References assert(), llvm::TargetRegisterInfo::isVirtualRegister(), and NO_PHYS_REG. Definition at line 160 of file VirtRegMap.cpp. References llvm::dbgs(), getAnalysisUsage(), llvm::MachineFunctionPass::getSetProperties(), ID, llvm::MachineFunctionPass::MachineFunctionPass(), MI, MRI, llvm::MachineFunctionProperties::NoVRegs, print(), runOnMachineFunction(), llvm::MachineFunctionProperties::set(), TII, and TRI. Definition at line 77 of file VirtRegMap.h. Definition at line 82 of file VirtRegMap.h. Referenced by llvm::AllocationOrder::AllocationOrder(), findNextInsertLocation(), llvm::RegAllocBase::init(), and llvm::SplitEditor::reset(). getOriginal - Return the original virtual register that VirtReg descends from through splitting. A register that was not created by splitting is its own original. This operation is idempotent. Definition at line 146 of file VirtRegMap.h. Referenced by llvm::SplitEditor::dump(), llvm::SplitAnalysis::isOriginalEndpoint(), and isRematerializable(). 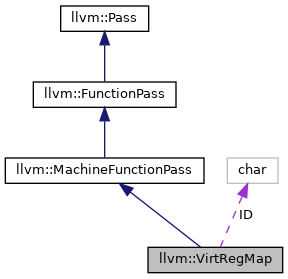 Definition at line 100 of file VirtRegMap.h. References assert(), assignVirt2Phys(), and llvm::TargetRegisterInfo::isVirtualRegister(). Referenced by llvm::LiveIntervals::addKillFlags(), getRC32(), llvm::ARMBaseRegisterInfo::getRegAllocationHints(), llvm::TargetRegisterInfo::getRegAllocationHints(), hasPhys(), hasPreferredPhys(), llvm::LiveDebugVariables::splitRegister(), and llvm::LiveRegMatrix::unassign(). Definition at line 138 of file VirtRegMap.h. Definition at line 87 of file VirtRegMap.h. Referenced by assignVirt2Phys(), llvm::RegAllocBase::init(), and isACalleeSavedRegister(). Definition at line 163 of file VirtRegMap.h. References assert(), assignVirt2StackSlot(), dump(), llvm::TargetRegisterInfo::isVirtualRegister(), and print(). Referenced by isAssignedReg(), and llvm::LiveDebugVariables::splitRegister(). Definition at line 88 of file VirtRegMap.h. Referenced by llvm::AllocationOrder::AllocationOrder(), and llvm::RegAllocBase::init(). Definition at line 76 of file VirtRegMap.cpp. Referenced by clearAllVirt(), and getTargetRegInfo(). This returns false if VirtReg has a preference that is a virtual register that hasn't been assigned yet. 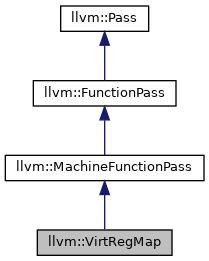 Definition at line 111 of file VirtRegMap.cpp. References llvm::MachineRegisterInfo::getRegAllocationHint(), hasPhys(), llvm::TargetRegisterInfo::isPhysicalRegister(), and llvm::TargetRegisterInfo::isVirtualRegister(). Definition at line 94 of file VirtRegMap.h. Referenced by llvm::RegAllocBase::allocatePhysRegs(), llvm::LiveRegMatrix::assign(), getRC32(), llvm::ARMBaseRegisterInfo::getRegAllocationHints(), and hasKnownPreference(). Definition at line 102 of file VirtRegMap.cpp. References getPhys(), llvm::MachineRegisterInfo::getSimpleHint(), and llvm::TargetRegisterInfo::isVirtualRegister(). Definition at line 153 of file VirtRegMap.h. References getStackSlot(), NO_PHYS_REG, and NO_STACK_SLOT. Definition at line 138 of file VirtRegMap.cpp. References llvm::MachineRegisterInfo::getNumVirtRegs(), llvm::MachineRegisterInfo::getRegClass(), llvm::TargetRegisterInfo::getRegClassName(), llvm::TargetRegisterInfo::index2VirtReg(), NO_PHYS_REG, NO_STACK_SLOT, llvm::printReg(), and Reg. Referenced by dump(), getStackSlot(), and llvm::operator<<(). Definition at line 62 of file VirtRegMap.cpp. References MRI, TII, and TRI. Referenced by dump(), and VirtRegMap(). Definition at line 133 of file VirtRegMap.h. Definition at line 68 of file VirtRegMap.h.